We also provide support to Seniors and sponsor the Pancake Breakfast and Pioneer Supper and provide parade marshals, volunteers, and food services to many community events. The Auction was originally adopted from a concept used by the Rotary Club of Prince George and a core group of Rotarians got it going and continued developing it from a live audience/radio/TV format to the slick production we see on TV today. Annual proceeds were over $91,000 in 2009. The auction passed the one million dollar net milestone in 2003. This clearly is the most significant fundraiser for our club. It funds most of our community service projects. The auction is scheduled annually for the last weekend in November (November 26-27, 2010) and involves the whole club. All funds raised by the Auction stay in the community. This started as the March for Dimes in the early 50's with all proceeds to Children's Hospital in Vancouver. In 1993 the funds were directed to our local hospital, earmarked for paediatrics. Annual receipts are about $15,000 and a total of over $350,000 has been raised including over $19,000 in 2009. The March, which we share with the Daybreak Rotary Club, takes place the last Saturday before Christmas and runs from 10:00 til 4:00 and involves about 100 Rotarians split into 3 shifts Our fellows who work in the high traffic areas (St. Anne’s and Hwy. 19A, and Dogwood and Second Ave.) must be nimble a foot. The Elk Falls Suspension Bridge Project started in 2009 as a vision by the Rotary Club of Campbell River to create an attraction to showcase this natural wonder. 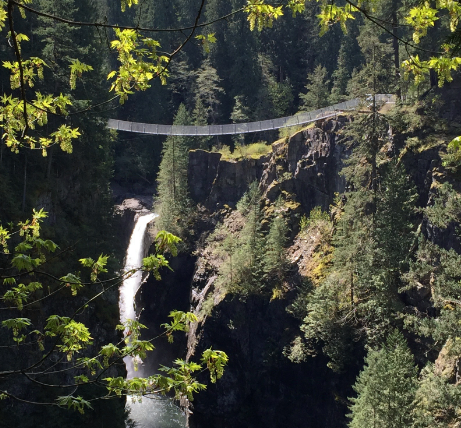 This world-class suspension bridge and viewing platforms are the result of the incredible work of Rotarians assisted by BC Parks, BC Hydro and the never ending support and generous donations of the people of Campbell River to the annual Rotary TV Auction. The Bridge is 60 meters long and 64 meters above the canyon floor, designed for safety to hold 120,000 lbs, the cantilevered viewing platform is 3 meters above the ground providing an amazing view of Elk Fall from the top to the bottom. We have also upgraded 340 meters of the existing Millennium Trail to be accessible to wheel chairs and those with mobility challenges and created 130 meters of new trail to the Elk Falls Suspension Bridge. The first 60 meters are accessible to all and include an accessible viewing platform with a view of Elk Falls and the pools above. In addition to the $130,000 donated by the Rotary Club, funding was also provided by BC Hydro, Community Futures Strathcona, and Island Coastal Economic Trust . The signature project of the Rotary Club of Campbell River is the Rotary Seawalk, from Maryland Road to the end of scenic Tyee Spit. Campbell River is spread out along the shores of Discovery Passage and the upper Georgia Strait. From the time of the earliest inhabitants, the travel path of least resistance was on water or along the shoreline. Paths or walkways of some description existed for years. In the late 1960’s the District adopted a visionary idea known as the Waterfront Acquisition Plan. The town slowly acquired oceanfront lands that enabled public access to the foreshore. In the 1980's, a gravel trail was constructed along the foreshore which covered about 50% of the distance between Hidden Harbour and Fran James Park in Willow Point. In time, that trail deteriorated. In 1996, the Rotary Club of Campbell River was looking for a project to celebrate the Club's 50th Anniversary. It was proposed by Ted Foster to build a waterfront walkway from Willow Point to the base of the First Avenue Hill. The Seawalk would be shared use between pedestrians/runners on one side and wheels (bicycles, skateboards, in-line skates etc) on the other. The hard surface would make it suitable for wheelchairs, stable underfoot for the elderly, close to the highway for security of the person and the waterfront view walk would be incomparable. This project was ultimately done in three phases. Phase One of The Rotary Seawalk ran 4.5 kilometers and cost about $400,000 excluding land and maintenance. Funding came from the Rotary TV Auction. This phase was completed between Hidden Harbour and Frank James Park during the years 1996-99. Phase Two began in 2000 as our “Millennium” project which extended the Seawalk south from Willow Creek to Maryland Road; built the boat launch ramp and Seawalk Centre; cleaned up the old Forde Garage property and the park generally and developed attractions of interest such as the anchor, Rotary wheel, recognition markers and information posts. The length of the Seawalk was now 6.2 kilometers. Phase Three began in 2006 and was completed in 2010 This phase included repairs and upgrading, replacement of the 50th parallel marker, building display panels at the Seawalk Centre, and placing 15 information posts at various spots along the Seawalk. Over $40,000 has been invested in this phase - with $20,000 coming from our Club. Overall the Rotary Seawalk has had a cash input value of about one million dollars, excluding land and maintenance. Rotary put up about $200.000 courtesy of the TV Auction. Five for one! Campbell River how has its million dollar Seawalk at minimal cost to the taxpayer. Campbell River is a seaside town, fishing and boating are great but having a comfortable, warm swim in the chuck was often out of the question because of the tide movements/cold temperatures. The answer was to bulldoze a rock berm tidal pool. Flood tide waters hit sun-heated rocks, and the resulting warm water is pleasurable. Rotarian Ken Antonelli was our inspiration/perspiration man. The park and parking areas were filled in. In recent years a portion of the area was released to the Campbell River Hospice Society and now sees use as a public memorial garden. Benches, tables and woodcarvings abound in the nicely landscaped park. Rotary recently placed an obelisk marker here to commemorate the Centennial of Rotary International. A boat launch ramp and the Ken Forde Park in Willow Point were completed as part of our Millenium projects. The Club with the assistance of Telus, the Daybreak Club, and the CR Firefighters raised over $300K for the construction of a Splash Park at the Sportsplex in Willow Point. This project was completed in 2012 and is a major attraction for residents and visitors. Rotarians were involved in Centennial Park and Pool from the outset. Over the years Rotary supported several upgrades leading to the major works undertaking on 2005 to mark the 100 th Anniversary of Rotary International. This project entailed a remake of the change room complex, offices, meeting rooms and a concession stand operated by our special needs friends. The logo with the sign is a means of identifying where publicly raised Rotary funds go. The total cost to Rotary was just short of $250,000 which made the pool upgrade the single largest financial committment ever undertaken by the Club. The latitude marker was built in 1974 and contains a time capsule. Campbell River shares this same north latitude with Sept Iles, Quebec; Plymouth, U.K., Frankfurt, Germany; Prague, Czechoslovakia; Krakow, Poland; Kiev, Ukraine; Kamchatka Peninsula, Russia and a whole lot of the open Pacific Ocean. The original marker deteriorated and has now been replaced by an updated version. In 2009, as a Community project, our Club provided a new audio system for the Tidemark Theatre which greatly improved the entertainment value and the ability of the Theatre to attract and host many new entertainment attractions for Campbell River. In the fall of 2012, a Club Hands-on project was completed to build a bridge at the Baikie Island site and improve the adjoining trail system. This project made access to Baikie Island much more convenient. The trailhead is 16.7 kilometers north of town, off Highway 19 at the base of Menzies Hill. On April 5, 1958 the world’s largest man-made non-nuclear explosion blasted away a twin pinnacle stone mass smack in the middle of turbulent Seymour Narrows. Whirlpools and water velocities of up to 20 knots had claimed 114 lives and dozens of ships over the years. Nature’s forces are in spectacular and breathtaking view from the last lookout at the 4 kilometer mark. The trail was built in 1982 by Rotary with substantial aid from a Canada Works initiative, BC Forest Service, BC Hydro, MacMillan Bloedel and helpful labour courtesy of the guests of Lakeview/Snowden Correctional facilities. Take Highway 28 to Quinsam campground or park near the Quinsam River bridge. Walk along the salmon rearing river for 3.3 kilometers up to the famous Quinsam Hatchery and beyond. All flat ground, it is an easy walk with the abundance of nature along the route. This trail dates back to the early First Nations fishery. Rotary was involved in upgrading, including bridge construction and trail extension work in 1983 and since. It is a mixture of trails along both sides of the Campbell River (Highway 28) between the logging bridge and the John Hart Generating Station. Upgraded in 1992, some sections in use as fishermen’s trails for eons. The Rotary involvement has been as a supporter/sectional upgrader. The upper Canyon Trail was built with Rotary providing major funding. It is an easy 1.5 kilometre walk through nature’s showpiece. Priceless! Access is off the end of Maple Street next to the Quinsam Hotel in Campbellton. Rotary has been a supporter, provider of interpretive signage and similar. The Nature Conservancy of Canada, the District of Campbell River, TimberWest, BC Hydro and others deserve credit. Access is off the west side of the Campbell River bridges area. A short, easy walk. Visit the man-made salmon rearing channels and walk the trails and cross two steel bridges built by Rotarians in 2004, from reclaimed steel ferry dock I beams. This 50 acre land treasure sits in the middle of the estuary with access off the north end of Robinson Road. This is a major habitat restoration project involving returning the estuary to its natural state. Rotary is involved with trail construction, reclamation of a de-watering site, interpretive signage and other supporting roles. Off South McPhedran Road or the junction of S. Dogwood and Hilchey. The Rotary “feat of note” is the construction of a 100 ton capacity bridge from recycled logging bridge materials. The cost was a fraction of the estimated replacement value. Canada’s fist saltwater public fishing pier became a part of the Campbell River landscape in 1986. Rotary was the first community sponsor, donating $10.000 and spearheading the drive for the locally raised $150.000 buy-in. Rotary contributed the automatic front entry doors at the hospital in 1996. We designated our calendar sales towards the purchase of special birthing beds. The club has met special requests, like arthroscopic equipment, heart monitors, hospital cars, pediatric gear and a host of needs. In 1988, it was proposed to build a centre on the grounds of Carihi Secondary that would cater to student mothers, who, with some assistance, could care for their infants and continue with their education at the same time thus alleviating the real world burden of parenthood and providing the necessary skills to enter the workforce effectively.. Surplus capacity could serve the general public and provide some balance. Facilities of this sort existed elsewhere but this was one of the first for Vancouver Island. Construction costs amounted to $240,000 by 1991 with our Club covering about two thirds of the cost. It is a success story. Over 60 students have graduated as a result. The Club completed repainting and repair projects in 2010 and 2015. During June 2011, the Club contributed 350 hours to the re-roofing of the Walter Morgan Studio in Willowpoint. This will help preserve and maintain the heritage building and provide useable space for the arts in the community.